Last month, the Ohio House of Representatives passed a workers’ compensation bill that, among other things, prohibits undocumented immigrants from receiving workers’ compensation benefits if they are injured on the job. The new bill also grants employers immunity for occupational injuries suffered by undocumented workers, unless the worker can prove the employer knew they were not legally authorized to work in the United States when he or she was hired. This bill disregards the ILO’s mandate that undocumented workers receive the same treatment as nationals. Worse yet is the fact that it incentivizes employers to hire undocumented immigrants without spending money on safety standards. Why ensure the safety of your national employees when you can cut corners and, in the event of a catastrophic worker injury, avoid paying compensation altogether? When undocumented workers are hired, they typically go through the same process — filling out an I-9 and a W-4, and submitting identification — as U.S. nationals. While it is illegal for both employers and employees to falsify I-9s, employers are not held to a strict standard in court. As long as the name on the paperwork matches the name the employee gives, and it is plausible that the person in their photo ID is the one getting the job, employers are not required to take any additional steps to verify their status. Unlike the many threats facing undocumented immigrants, the employers that hire them face little risk for breaking the law. 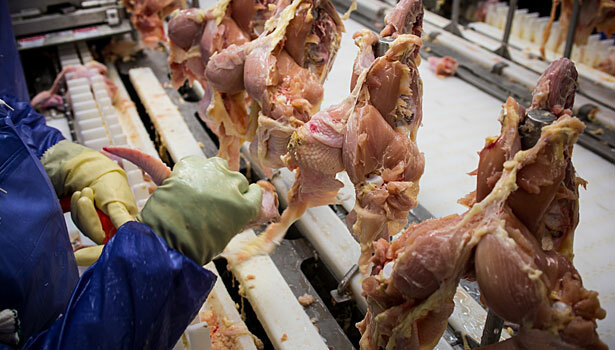 Case Farms has a long history of hiring the most vulnerable workers for its chicken plants, and is no stranger to its workplace injuries. 17-year-old Guatemalan immigrant Osiel López Pérez injured his leg scaling a piece of machinery after the Case Farms plant in Canton, Ohio ran out of ladders. López Pérez was rushed to the nearest hospital, where the lower part of his left leg was amputated. When López Pérez returned to work at the factory, his supervisors demanded to see his identification papers. In mere days, he and several others were fired, despite Case Farms never caring about their documentation before. In earlier instances, Case Farms has been accused of assisting its employees in obtaining false documentation so they may work. Cases like López Pérez’s are all too common, and Ohio’s new legislation will only make matters worse by depriving López Pérez of the right to sue Case Farms for compensation. Despite the fact that he was left permanently maimed and unemployed, some might consider that López Pérez could have suffered a worse plight: he could have been arrested or deported. Many workers who fight their employers for unpaid wages face this outcome, like Luis Zavala, a Louisiana-based construction worker who thought he was going to meet his employer to receive back pay but instead found himself surrounded by ICE agents brandishing firearms. Until the United States strengthens penalties against employers found to be knowingly hiring undocumented workers, such injustices will continue to happen. At present, there is no true incentive for them to change their behavior. Borchardt, Jackie. “Ohio House Passes Workers’ Comp Budget The Eliminates Benefits for Undocumented Immigrants.” Cleveland.com 17 May 2017. Grabell, Michael. “Exploitation and Abuse at the Chicken Plant.” The New Yorker 8 May 2017. Harris, Paul. “Undocumented Workers’ Grim Reality: Speak Out on Abuse and Risk Deportation.” The Guardian 28 March 2013. Human Rights Watch. “Immigrant Workers in the United States Meat and Poultry Industry.” 15 December 2005. Ralph, Talia. “How Restaurants Hire Undocumented Workers.” Eater 28 February 2017.